One of the best ways to appreciate the rich history of Scarsdale is to look at the changes that have occurred—for better or for worse—through a series of maps. Below is a selection of maps available online from the David Rumsey Map Collection. Clicking on a map will take you to the Rumsey site, where you can enlarge the map and pan across it to see details. 1867 Mamaroneck, Scarsdale, White Plains, Harrison & Rye. 1868 Towns of White Plains and Scarsdale. 1872 Towns of White Plains and Scarsdale. 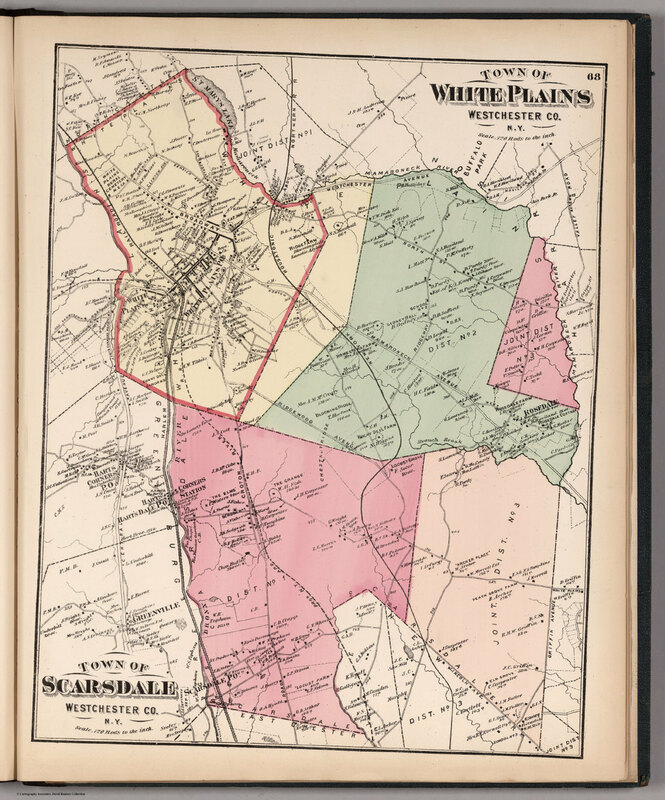 1881 Towns of Scarsdale and White Plains. 1893 Towns of Scarsdale, New Rochelle and Mamaroneck. 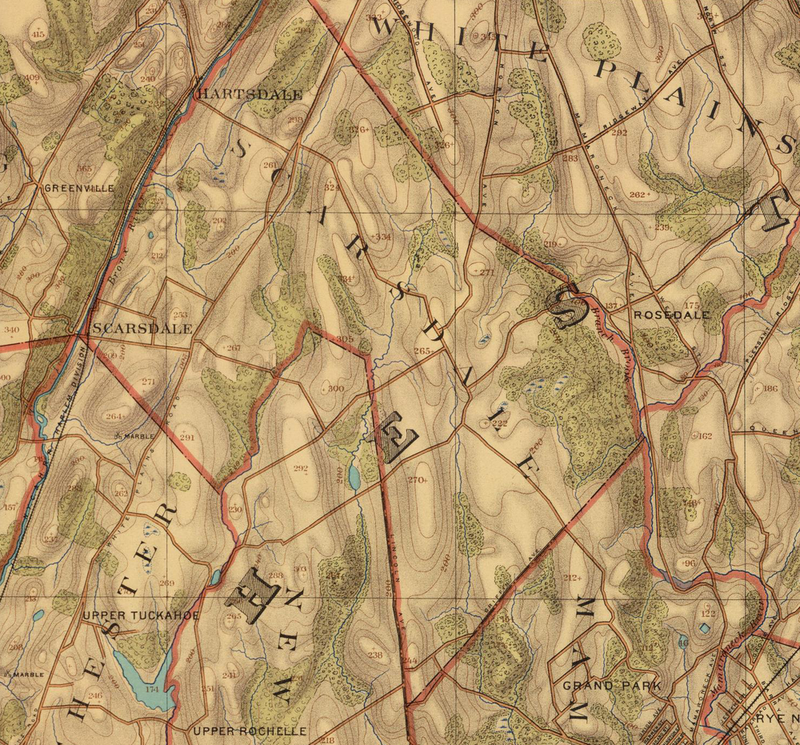 1893 Detail of the Scarsdale area, topographic map. 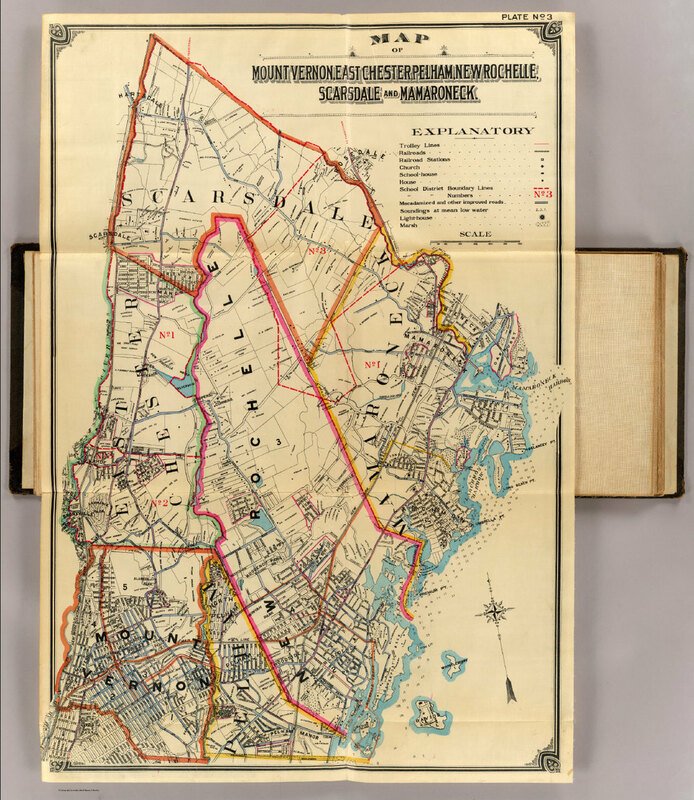 1900 Map of Mount Vernon, East Chester, Pelham, New Rochelle, Scarsdale and Mamaroneck. 1910 Part of the town of Scarsdale. See the Rumsey site for other sections. 1914 Part of the town of Scarsdale. See the Rumsey site for other sections. From Atlas of New York and Vicinity from Actual Surveys by and under the direction of F. W. Beers, assisted by Geo. E. Warner & others. Published by F.W. Beers . . . 95 Maiden Lane, New York, 1867. Towns of White Plains and Scarsdale, 1868. From Atlas of New York and vicinity from actual surveys by and under the direction of F.W. Beers. Published by F.W. Beers . . . 95 Maiden Lane, New York, 1868. Towns of White Plains and Scarsdale, 1872. From County Atlas of Westchester New York. Published By J.B. Beers & Co. . . . 36 Vesey Street, New York. 1872. Towns of Scarsdale and White Plains, 1881. From Atlas of Westchester County, New York. From actual surveys and official records by G.W. Bromley & Co., Civil Engineers. Published by Geo. W. & Walter S. Bromley. 243 Broadway, New York. 1881. Towns of Scarsdale, New Rochelle and Mamaroneck, 1893. From Atlas of Westchester County, New York. Prepared under the direction of Joseph R. Bien, E.M., civil and topographical engineer from original surveys and official records. Published by Julius Bien & Company, New York, 1893. Detail of the Scarsdale area, topographic map, 1893. 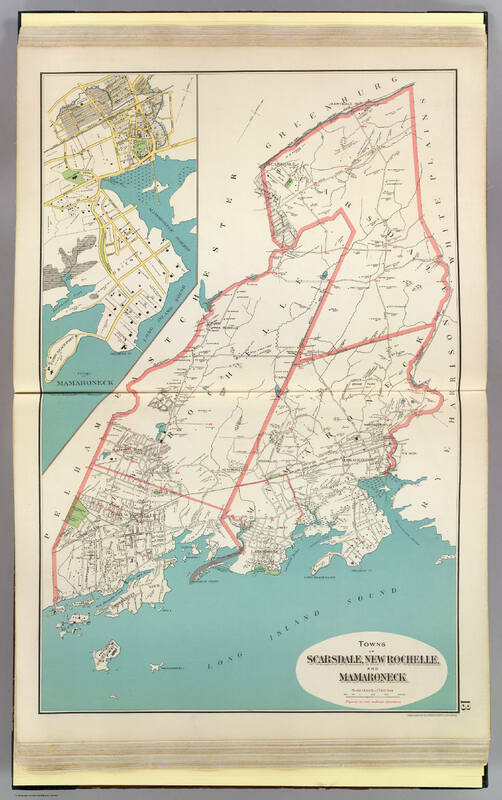 Map of Mount Vernon, East Chester, Pelham, New Rochelle, Scarsdale and Mamaroneck, 1900. From Map of the Greater Portion of Westchester County, New York and the towns of Greenwich and Stamford, Conn. Hyde & Company, 97 Liberty Street, Brooklyn, New York, 1900. Part of the town of Scarsdale, 1910. See the Rumsey site for other sections. From Atlas of Westchester County, volume 1. From actual surveys and official plans by George W. and Walter S. Bromley, civil engineers. Published by G.W. Bromley and Co. 147 N. Fifth St., Philadelphia. 1910. Part of the town of Scarsdale, 1914. See the Rumsey site for other sections. Atlas of Westchester County, N.Y. Pocket, desk and automobile edition. Volume I. Mt. Vernon, Pelham, New Rochelle, Mamaroneck, Rye, Harrison, White Plains, Scarsdale and Eastchester. G.W. Bromley & Co., 34 Pine Street, New York, 1914.